According to Wikipedia an invisible ink is a substance used for writing, which is invisible either on application or soon thereafter, and which later on can be made visible by some means. Invisible ink is a theme in two recent nanotech ventures: Walz et al. (DOI) write with iron and Wei et al. write on graphene oxide (DOI). In regular electron beam-induced deposition , iron pentacarbonyl gas is used to write iron nanostructures on an SiOx monolayer. The electron beam of an scanning electron microscope decomposes the gas and iron particles land at the targeted area. In an ultrahigh not high vacuum environment the iron deposition efficiency can be as high as 95%. Writing a single line of 45 micron length and 95 nm width takes 3 hours. Walz et al. discovered that it is also possible to first write the message using only the electron beam and then expose the silicon oxide surface to the iron pentacarbonyl. Appearantly the SiO surface becomes activated for Fe(CO)5 to catalytically decompose (the exposed surface is visible as a dark line in a regular EM image). Walz reassures her readers that other applications are pursued than just writing secret nanomessages. In the second invisible ink nanotech application Wei et al. 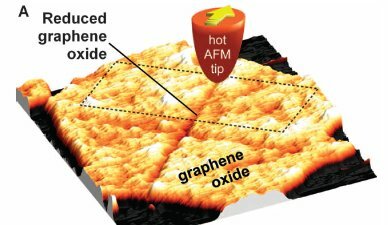 use the heated tip (330°C) of an atomic force microscope to write patterns on a layer of nonconducting graphene oxide (GO) by converting it to conducting reduced GO which is very similar to graphene. The surface height is reduced by 2 to 5 nm by combination of two effects: loss of oxygen atoms and conversion of rippling sp3 carbons to flat sp2 carbon atoms. A typical writing speed is 2 micron per second and the rGO trench has a 25 nm width.